Here at Hartford HealthCare, we are taking a new approach to bariatric, or weight loss, surgery. In the past, we would often look at any diet, exercise program, or weight loss surgery procedure in terms of how much weight we could expect a patient to lose. In fact, most overweight or obese Americans about to start a new diet, exercise program, or have weight loss surgery set unrealistic “weight loss” goals for themselves, leading to disappointment and a sense of failure. That’s part of the reason our team of surgeons and weight loss experts is now focused on asking not how much can you lose, but instead, what will you gain? 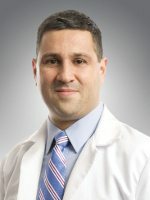 Dr. Darren S. Tishler, director of Metabolic and Bariatric Surgery at Hartford HealthCare. How Do I Know If Weight Loss Surgery Is For Me? Most people feel that weight loss surgery is for someone who is hundreds of pounds overweight, someone who can’t walk or someone who is in extremely poor health. That couldn’t be further from the truth. In fact, our goal is to make sure that our patients don’t ever get to that point in the first place. From a purely weight standpoint, women about 60 pounds or more overweight and men about 70 pounds or more overweight might be candidates for weight loss surgery. A better measure that takes into account both height and weight is Body Mass Index, or BMI. A BMI of greater than 35 kg/m2 with other health problems, or a BMI of 40 kg/m2 or more with or without medical problems are considered candidates for weight loss surgery by most insurance companies, although some offer coverage for BMI greater than 30 with certain health problems. You can easily calculate your BMI by clicking here. Have a Body mass index 40 or greater. Have a Body mass index 35 or greater with a major health issue such as diabetes, high blood pressure, high cholesterol, or sleep apnea. Are more than 40-60 pounds overweight. Are not able to walk or easily perform everyday activities as a result of your weight. Are worried about a family history of obesity.
. . . You might be a candidate for weight loss surgery. Consider talking to your health care provider or a weight loss surgeon about your options to lose weight and see what you can gain from a healthier life. Preventing these health problems from ever happening in the future. Many people don’t consider weight loss surgery early enough. Patients who are overweight need to consider both their personal health issues as well as their family history. For example, an overweight person with obese parents with diabetes, high blood pressure and a history of heart disease should be more aggressive at treating their weight at an earlier stage in their life. We offer weight loss surgery because the risk of surgery is substantially lower than the risk of dying prematurely from obesity related diseases. Unfortunately, some patients wait too long before considering weight loss surgery and only consider it as an option once they have been diagnosed with possibly irreversible health conditions. What Can I Gain From Weight Loss Surgery? From a purely medical standpoint, weight loss surgery helps to lower the risk of dying of stroke, heart attack, lung disease, blood clots and certain cancers. Arthritis, joint and back pain are all lessened with the reduced weight and impact on the joints, muscles and back. Weight loss also helps to control or cure many obesity-related health problems like diabetes, high blood pressure, high cholesterol, infertility, breathing problems and sleep apnea. More important, you will likely live longer. Most patients also experience a higher quality of life. The improvement in mobility is perhaps the most important gain from weight loss surgery. As a result, it is easier to walk, exercise and do just about everything with less effort. A number of procedures are available to treat severe obesity. No single procedure is right for everyone. When you meet with our surgical weight loss team, we will help you determine which procedure is best for you. Where your weight is distributed. Whether you have gastrointestinal reflux (GERD), previous abdominal surgeries and other health problems. We also work with you to identify any lifestyle concerns that would make one procedure preferred over another. The goals of surgery for obesity are to lose weight and improve health-related problems. Patients work with a multidisciplinary team both before and after surgery. Our teams offer patient centered care and an individualized plan of care. This approach ensures the safest and most successful experience for every patient. Our teams include board-certified surgeons, advanced practitioners, program coordinators, patient navigators to assist with the work-up process, nursing staff, and highly experienced nutrition, behavioral health and exercise specialists. The goals of bariatric surgery are to support weight loss and improve health and lifestyle. These procedures work with lifestyle changes in both diet and exercise. Success of the surgery -- weight loss and quality of life improvements -- is determined by each patient. Results vary and depend greatly on your motivation and long-term compliance. Successful weight loss corrects or improves many weight related health issues such as diabetes, high blood pressure, reflux (GERD), sleep apnea and high cholesterol in many patients. Weight loss can also help improve osteoarthritis and joint and back pain, fatty liver disease, asthma, polycystic ovaries and infertility. Many patients are able to reduce the amount of medications they take on a daily basis for their health conditions. A trip to celebrate a special occasion with family or friends. Building something with a grandchild. Getting outside to do more adventurous activities like skiing, sailing, or hiking. Riding a bike to an area that can’t be accessed by car. Participating in sports with your kids, not just watching them play.